Take 3/4 cup of butter out of the fridge to let it soften while you read this. And pre-heat your oven to 350°. Don’t ask questions; just do it! All will be revealed in good time. There’s little that’s better than chocolate with some coffee. Unless, of course, you’ve got a cookie that combines the two flavors. Behold! The little dippers. These festive beauties are also hand-held comfort nuggets, so they look as good as they taste. Added bonus: they’re really easy to make. Here’s the recipe, and surprise, surprise! I didn’t deviate from it much. So let’s get to it. 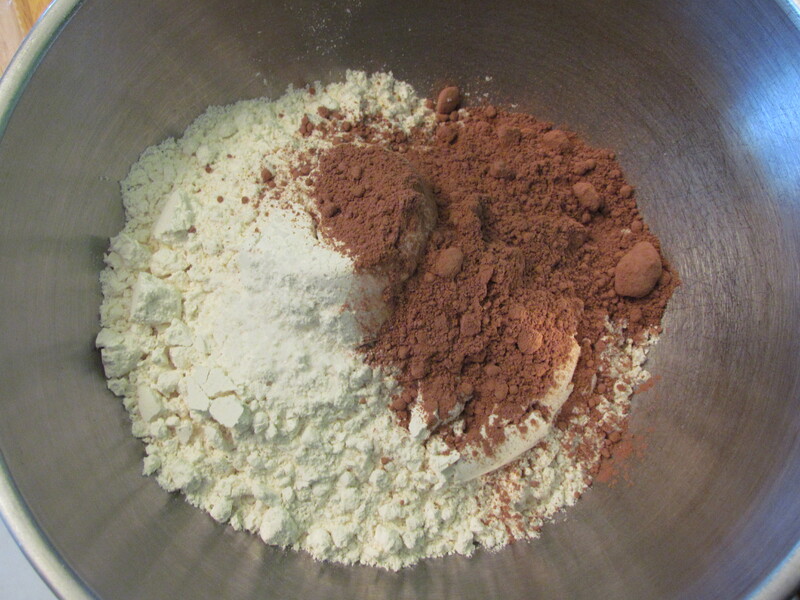 Put your flour, cocoa and salt into a bowl. Of course you’ll stir it together. But first, just notice that it looks cool. Give it a stir to combine, then set it aside. 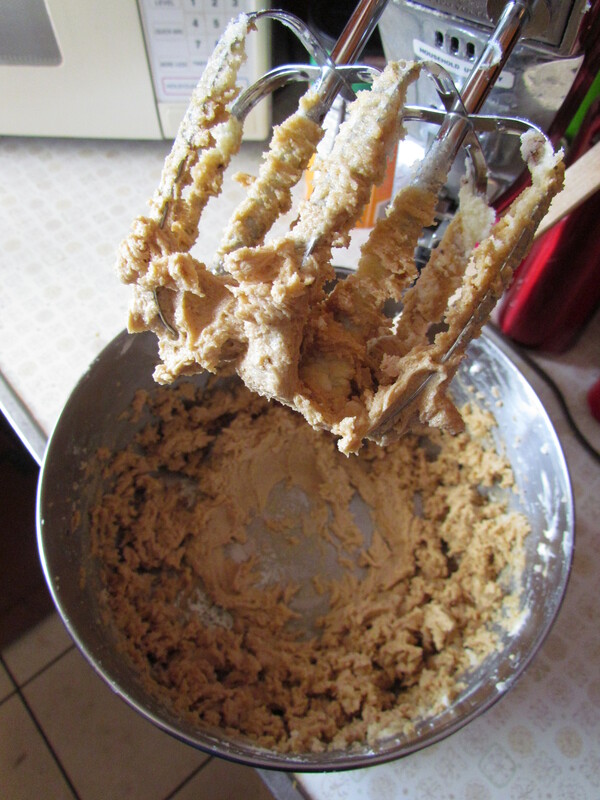 Put your nicely softened butter into a mixing bowl and whip it for a minute or so, and then add your sugar in and cream the two of them together. If you don’t have nicely softened butter, you can of course do the “put it on a plate and in the microwave for eight seconds and see if it’s soft, and then microwave again” process, but please be careful. You don’t want the butter to liquefy, and as anyone who’s ever eaten butter knows, it’s verrrry easy to over-microwave into a puddle. Should that happen you would have to wait for the butter to start to firm up again before cooking, which is an ironic way to complicate this recipe. True story: when I was a kid, I would cream together butter and sugar and have that on bread as an after-school snack. Of course I ate it on overprocessed white bread, too, so I was basically mainlining pure carbs. What a rush! I still sort of miss it. Mix in your egg and your espresso powder. If you ever wanted to know what buttery sweet coffee tastes like, here you go. For those who think they’ve got such mad skills that they don’t need to crack eggs into a separate container in case they break any shell into it, let me remind you: I have been baking for years and did, indeed, break some shell into the egg. I was so glad that for once, at least, I had actually taken my own advice and cracked my egg into a little cup. Fished the shell right out, no drama, no concern about my cookies coming out crunchy-style. Since I’ve been able to find instant espresso powder even here in my tiny hamlet, I assume most people would be able to get their hands on some in their own grocery stores. If not, check out Amazon or other online outlets. Hooray, internets! Ingredients can be had. 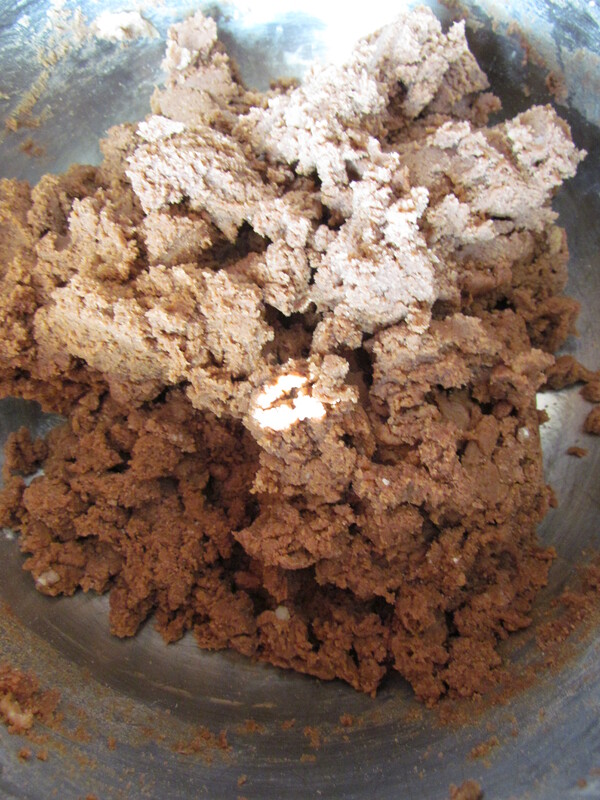 Then add in your cocoa and flour mixture. 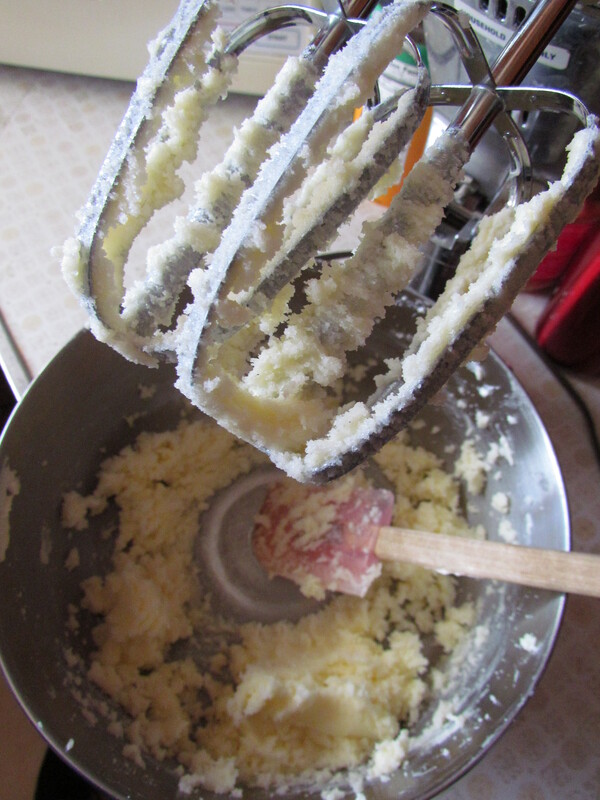 What’s the magic word when mixing a powder into a whirring set of beaters? Incrementally. In this particular recipe, I was able to get all the flour added without having to mix by hand. You’ll have crumbly dough that looks a little like rubble. Here is one of the areas where I deviate from the recipe. It doesn’t call for putting the dough in the fridge to firm up before you roll and cut them. Here’s the problem with that: butter-based goods, like this one, become notoriously difficult to handle when they’re warm. Rolling them out is fine. Cutting them with a cookie cutter is fine. 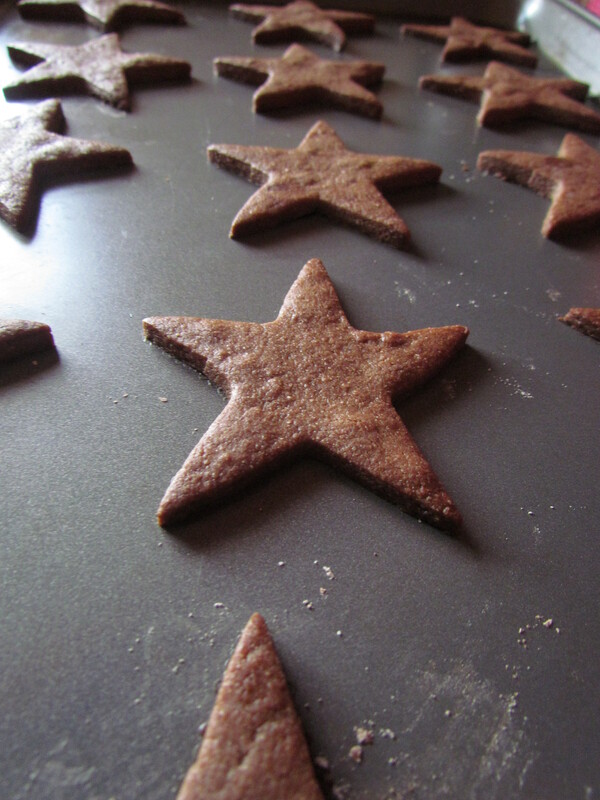 Getting them up off your work surface and onto a baking sheet? That can be a bit of a problem. They’re too malleable and susceptible to tearing and distortion. Regardless of what the directions say, once you divide your dough in half, wrap it in plastic and let it firm for an hour or so before rolling. Once they’ve firmed, it’s time to roll them out on a floured work surface. To preserve the chocolately goodness of the cookies, you can flour the work surface with a half-and-half mix of flour and cocoa powder. Oh, snap! Yes, you CAN do that, OMG! Works like a charm, and I am a total tart for all things chocolate. 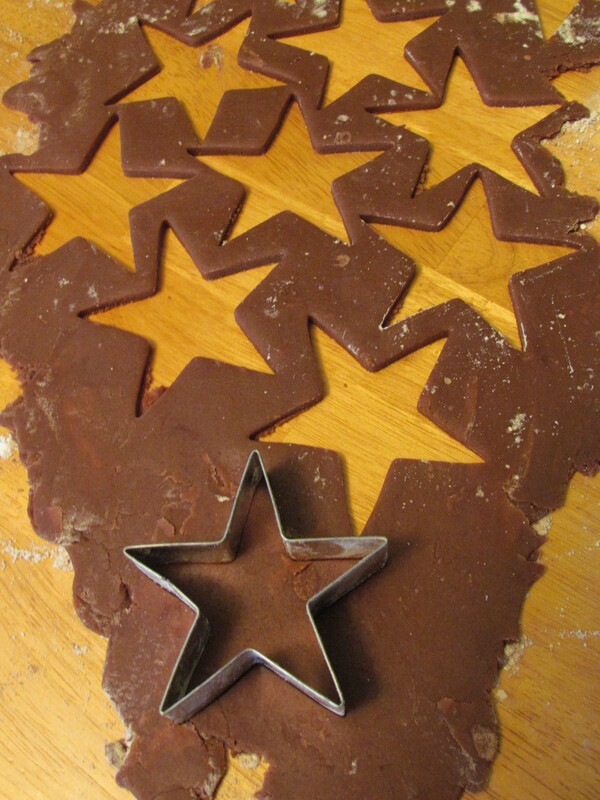 Then cut them out with a star-shaped cookie cutter (or whatever shape you prefer, actually. I won’t judge), put them on an ungreased cookie sheet, and into your waiting, pre-heated oven. No matter how good they are right now, they’re going to be even better by the time we finish with them. Once they’ve cooled, melt the chocolate in something nice and heatproof and deep enough for good dipping, in the microwave (or a double-boiler, if you don’t have a microwave, and check out this post to find out how to make an ersatz double-boiler without buying fancy dedicated equipment). Dip each cookie, one-third to one-half deep into the chocolate. Resist all urges to dunk the entire thing in a chocolate craze. Lay the cookies out on wax paper so the chocolate can get and then? 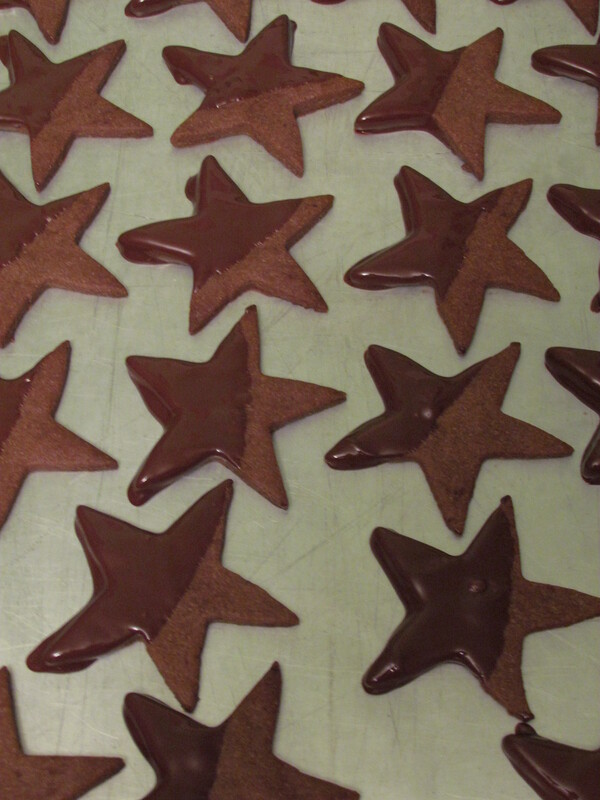 Chocolate-coffee cookies stretch as far as the eye can see.